To export a chart, simply right-click on it. This is the only way to export an image in Calc. Most other functions in the spreadsheet can be performed through the menus, toolbars, as well as the right-click menu. EMF (Enhanced Metafile): This is Window’s vector graphic format. It is also used as vector graphics language for printers. EPS (Encapsulated PostScript): This format is typically used in professional drawing applications, such as CorelDraw and Photoshop. GIF (Graphics Interchange File): This format is good for images with flat or single-tone colors. JPEG (Joint Photographic Experts Group): This format is the most popular. It is best used for photographs, gradient images, and Web images. This is a lossy format. Each time a JPG image is saved, some information is lost. The lost data isn’t noticeable unless it has been saved a lot. PDF (Portable Document Format): This is typically used on full documents, so they can be shared among different users. The document will look the same computer to computer. PNG (Portable Network Graphic): This is like GIF, but it is an open format. It handles transparency better than GIF. PNG is a good option for images which need transparency. TIFF (Tagged Image File Format): This format supports lossless compression. For graphs, it creates the largest files of all the choices in this list. SVG (Scalable Vector Graphics): This file format, developed by the Worldwide Web Consortium (W3C), does not rasterize graphs. It keeps them as vector graphics. Many content management systems, such as WordPress, do not allow SVG graphics to be uploaded and inserted into a page without a plugin. 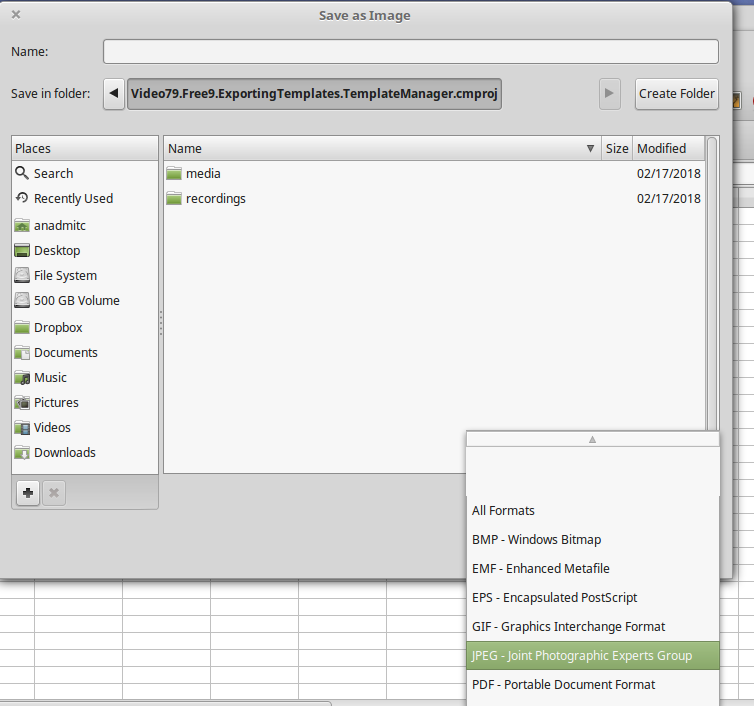 SVM (StarView Metafile): These are like the WMF format, but it is used by LibreOffice and OpenOffice, when images are being inserted into a document or copying and pasting an image from one document to another. WMF (Windows Metafile): This is a proprietary Windows format that is not used much anymore. It is mainly used for drawing operations. Though all these formats are options, the graph may not convert well into all of them. TIFF, JPEG, GIF, and BMP tend to work the most consistently. Some of the other formats do not render graphs well. Excel cannot turn an image into a stand-alone graphic by itself. It needs the help of Word or PowerPoint. Both these applications have an item in their right-click menus that is similar to “Export as Image” in Calc. The chart needs to be copied and pasted into a Word document or PowerPoint presentation. The pasted image can be saved as a stand-alone image. There are several other methods to save a chart as an image. The following steps are recommended by Microsoft. Click on the desired graph so the entire chart is selected, not individual parts of it. Open a new document in Microsoft Word or presentation in PowerPoint. Pasting into another Excel spreadsheet or workbook will not bring up the menu item in Step 9. 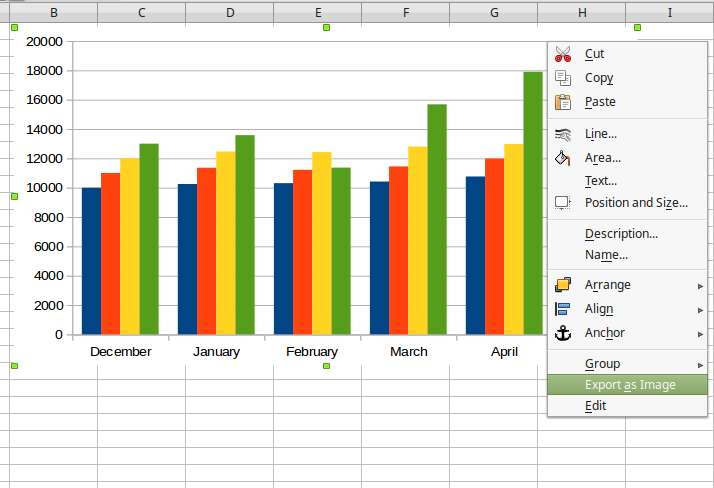 Microsoft Excel: Saving chart as stand-alone image from OS-College on Vimeo. Select the Home ribbon in Word or PowerPoint. Click the arrow below the Paste icon. 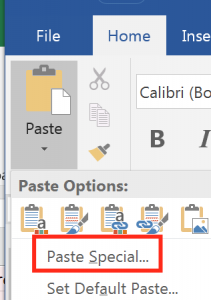 Click the Paste Special item in the Page Options dialog that appears. In the Paste Special dialog that appears, select the desired format to paste the picture. Microsoft Excel Chart Object and Microsoft Office Graphic Object will not have the item in Step 9. The other five formats have this item. When the image appears in the Word document or PowerPoint presentation, right-click on the newly pasted chart image. The right-click menu has an item called “Save as Picture.” This is only available in five of the formats, and it is only available in Word and PowerPoint. Click this item and a File Save dialog opens. Give the image a title, choose a location and format for it. The new image of the chart can now be inserted into a blog, chat session, or another document. Calc makes saving a chart as a stand-alone images easy. Excel for Windows method is longer, harder, and more cumbersome. While many Office users may not be concerned with making their charts stand-alone, others need this capability desperately. Anyone who needs to post their charts to a Website or share it independently of the application used to create it will find this feature important. Calc’s simplicity gives it a great advantage over Excel in this regard. The open-source application has another advantage as well. It is flexible. Calc can open documents in Excel formats and typically not break the formatting of those documents. Charts created in Excel spreadsheets still appear when the documents are opened with Calc. When a chart created in Excel is right-clicked on in Calc the “Save as Image” is in the list. Excel users may find that using LibreOffice as a companion application for creating stand-alone graphs is much easier than using the copy and paste method that Microsoft recommends. In many ways Excel is more advanced than Calc. However, the open-source application has some features and functions that it does better than Excel or does better. This is clearly one of them.